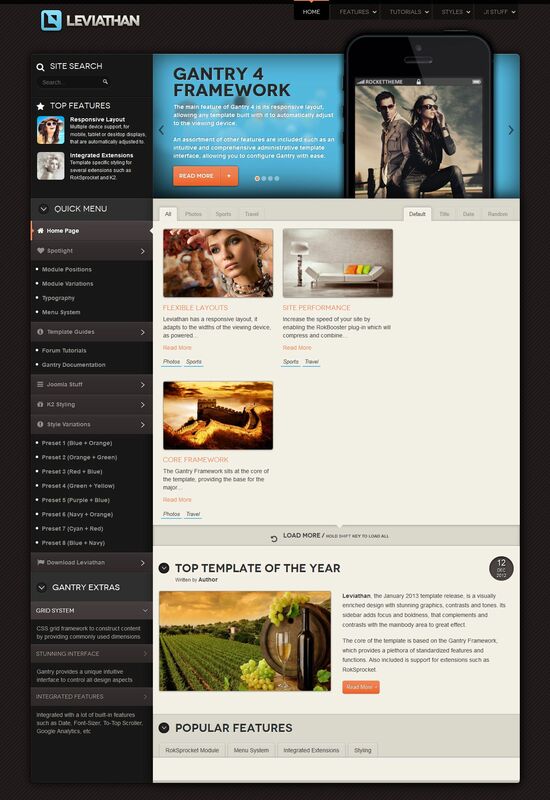 RT Leviathan - chic template for Joomla 3.0 from the popular studio RocketTheme. This template has a great design that is presented in 8 unique variations. Awesome graphic design layout, containing the original colors and contrasts, which meets all modern requirements. Powerful framework Gantry, running pattern, provides full access to all parameters, and is also responsible for adaptive functions to display correctly on any website mobile and tablet devices. In the assembly is brand extension RokSprocket, as well as the popular K2 component to support additional styles, guaranteeing flexible accommodation and convenient display of all information on the site.